On August 24, Punknews is throwing the Summer Soiree 2! 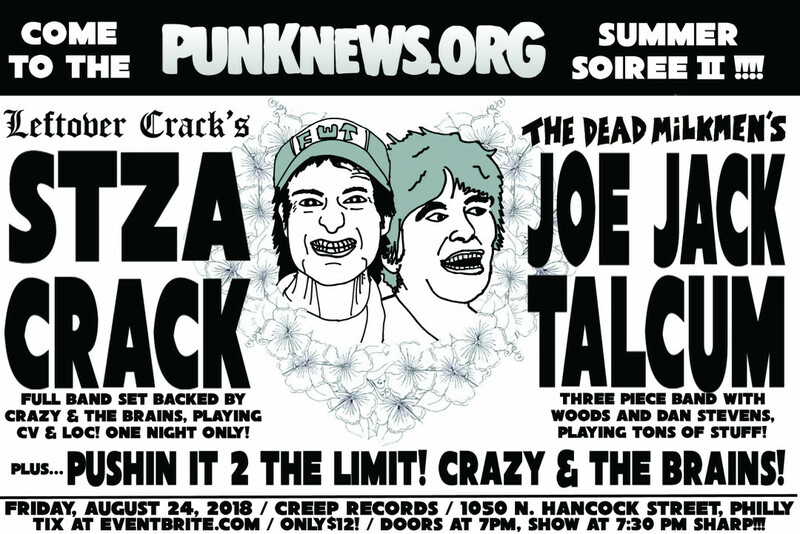 Co-Headliners are Joe Jack Talcum of The Dead Milkmen (backed by Woods and Dan Stevens) and Stza Crack of Choking Victim and Leftover Crack playing a CV/LoC full band set backed by Crazy and the Brains! Pushin' It 2 the Limit opens! That's at Creep Records in Philly and you can find more info right here. You can also pick up advance tix right here! Only 12 bucks! Last night, Punknews' John G was on 106.5 FM in Philadelphia for DJ Ryan Chitty's "Bullying the Jukebox" program. He talked about the event, played some tracks by each band, and dug deep into his collection and spun some rarities by bands including World/Inferno Friendship Society, Lee "Scratch" Perry, Mischief Brew, Beastie Boys, The Rolling Stones, Up! Up! Ups!, and many more. Listen to the entire special below, right now.